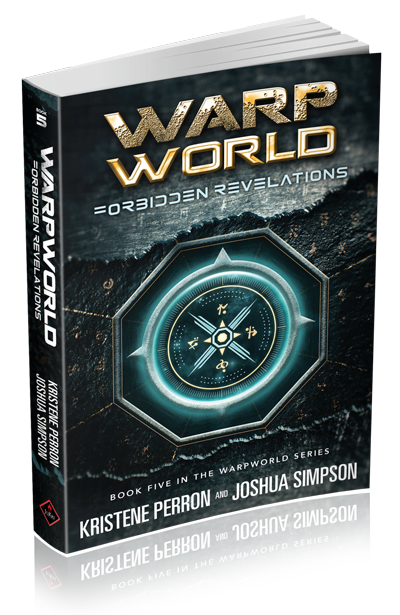 Warpworld V: Forbidden Revelations is here! At last, the answer to the question, “When will the final Warpworld book be out?” is…NOW! This one was more than a labour of love, it was a labour of sweat, tears, and some choice curse words. Very choice. But we’re excited to give you the final chapter in Seg and Ama’s story and we hope you’ll be excited too, and maybe a little surprised. We have some celebrations planned to go out with a bang. Starting on January 17th, we’ll be running our final blog series here on the Warpworld Comms. We’ll kick off with a conversation between Josh and I, looking back on the series, with some behind-the-scenes stories and photos. Then, we’ve invited a few guests to come and talk about those two little words that can change us forever: “The End”. You’ll meet a bestselling author whose debilitating illness opened an unexpected creative window; a Game Master whose first campaign ending was truly magical; a sister who discovered a hidden side to her brother after his death; and an author who has some advice for writers grieving over the end of a writing project. We’ll also have a few surprise treats and giveaways, so keep tuning in here or on our Facebook page. Thanks for sticking with us! Here’s to The End! adventure science fiction, book launch, Complete science fiction series, science fiction series, Warpworld Volume 5. You Are Invited To: A Pity Party!